Maisie Dobbs Investigates the Mysterious Death of a Controversial Artist -- and World War I Veteran -- in the Fourth Installment of the Bestselling Series. London, 1931. On the night before the opening of his new and much-anticipated exhibition at a famed Mayfair gallery, Nicholas Bassington-Hope falls to his death. The police declare the fall an accident, but the dead man's twin sister, Georgina, isn't convinced. When the authorities refuse to conduct further investigations and close the case, Georgina -- a journalist and infamous figure in her own right -- takes matters into her own hands, seeking out a fellow graduate from Girton College: Maisie Dobbs, psychologist and investigator. 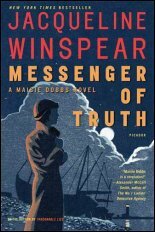 In Messenger of Truth, Maisie Dobbs again uncovers the dark legacy of the Great War in a society struggling to recollect itself in difficult times. But to solve the mystery of the artist's death, she will have to remain steady as the forces behind his fall come out of the shadows to silence her.